Double veil phantom! This rare, rare ocurrence gleams in the blazingly clear top half of this great Arkansas channel faced rock crystal [your price offset by 1/8" record keepered ding]. 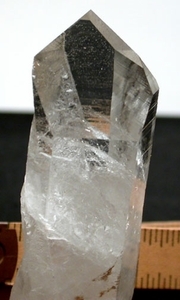 The lower half features a side-ways V of deeper veils, rainbows and light natural clay inclusions, grounding a base in regrowth...a Hera crystal. 1x 1x 3-1/2" tall, three long prisms curve to fit your hand where another crystal had grown long ago.